Edreys Wajed is a Buffalo poet and visual artist, among his other artistic talents. 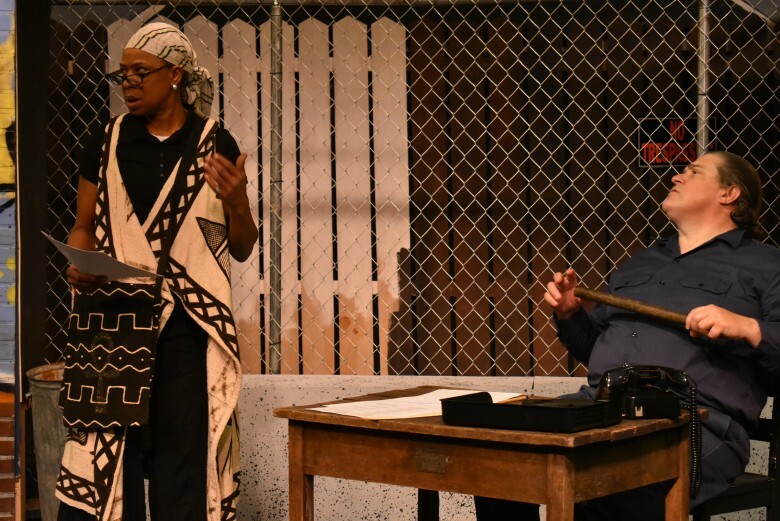 His poem, “The Sidewalk,” is the inspiration for the compelling new play at Paul Robeson Theatre, The Sidewalk Stageplay. In the poem, narrated on stage by Mr. Wajed, the sidewalk speaks about its role in the neighborhood, the place where people meet, love, fight, and die. It feels the press of sneakers, the bounce of a basketball, and the heat of bullets when they fall on its surface. In the play, the verbal is made manifest through the lives of the people who walk its concrete—a mother searching for her son, a drug dealer on the corner, a basketball star chatting with a girl, an addict pushing a stroller, an old man picking up cans, and two police officers, among many others. In a series of short scenes connected by a narrative thread, the poverty, prejudice, racism, frustrations, and joys of daily life for urban African American people are presented in spoken word, rap, dialogue, poetry, and song. Very well written by Mr. Wajed and Paulette D. Harris, Artistic Director of the theater and Director of the play, the scenes are microcosms of daily life in which the audience comes to know each individual—and there are 14 in the cast—on a personal level. They are well defined people rather than stereotypes, so their frustrations and joys are felt by the audience. To illustrate the scenes and narrative thread, a father with his children in the car is stopped by a white policeman and placed in a humiliating situation. Two women laughing and dancing at a picnic are harassed by a white woman jogging by. The boy who was in the car with his father is confronted by a young, white rookie officer, the son of the sadistic cop, who turns out to be very kind and playful with the boy. Four women wearing hats sing about the joys of their “crowns.” A young teacher helps a student who is struggling at home. The basketball star romances that same young girl, and it is his mother and the teacher who were harassed by the jogging woman. The large cast is more than up to the task of this complex and verbally demanding play. Linda Barr is a standout as Loretta, the mother looking for her son. Mike Hicks as Richard, the father, had the audience in tears when he spoke of his humiliation by the white cop, a thankless role well played by Daniel Greer. Isaac Fareed as the young boy, Chris, is delightful. Andy Noel as Mike, the basketball player, is very charming. Anthony Clark is very believable as Rock, the drug dealer. Ayana Naomi is very earnest and kind as the young teacher, Monique. Chalma Warmley is impish as the old man. Arterist Molson, Janisha Whitlock, Janine D. Glover, Madeline E. Allard and Zack McCarty round out the cast. The elements of stagecraft are used to good effect to create different moods for each scene. 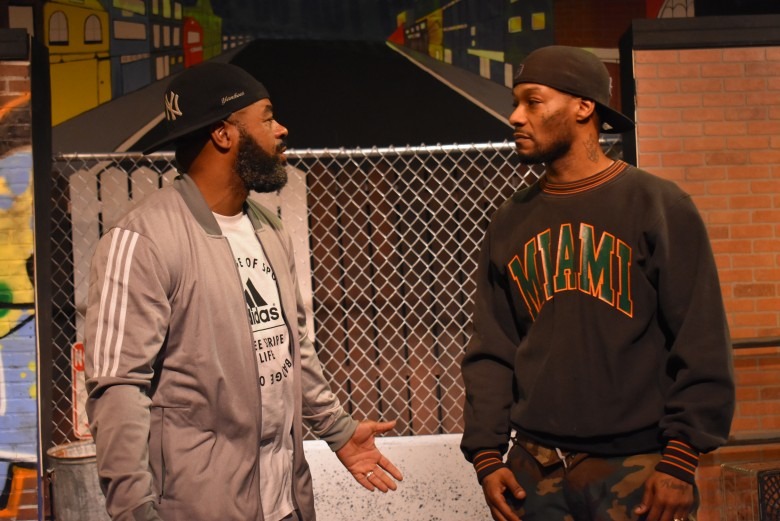 The set designed by Antonio Harris is reminiscent of an urban block, with graffiti-adorned brick walls and an upstage fence behind which the audience can see people coming and going. The street scene painted on the back wall adds to the urban vibe. Lighting is deftly used to create the moods of each scene. It is red when the child Chris speaks of blood at the beginning of the play, while black light gives an otherworldly feel to some scenes. There is a great deal in The Sidewalk Stageplay to think about, and a great deal to feel. It is well written, well acted, and almost three hours of thought-provoking, entertaining theater. You can see The Sidewalk Stageplay at Paul Robeson Theatre through April 7th.